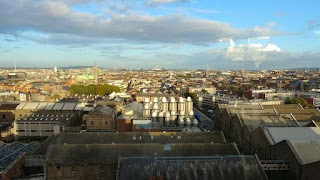 Guinness Storehouse- Dublin's number one tourist spot for a reason! When I started looking into what I wanted to do when I get to Dublin I immediately wanted the Storehouse. Why, you ask, since you don't drink or even LIKE any beer at all, ever? Well, I like the stories, and I wanted to do some of the more traditional (ie: touristy nowadays) Irish stuff I could- drinks, dancing, and history. 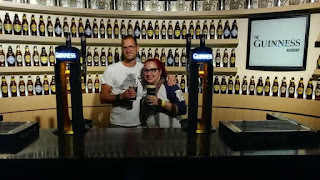 The Guinness Storehouse, located in Dublin 8 at St. James Gate was by far my favorite tour in Dublin—and we probably went to 6 or 7! Plus our own wandering and musings! Well, first off, we got the Dublin Pass, which I cannot recommend enough. The guidebook for the Pass said the storehouse closes at 5pm and let me tell you how much of a lie that is! We ran our happy (grumpy) asses, after hours of taking in sights and pavement chasing and Red Bulls because the clock said 4:40 and the last tour is at 5. So, naturally there was road construction throughout our walking path, I feared my aching feet would just plum fall off from the speed of brisk walk I set, we got lost, and then finally arrived at St. James Gate only to find that the actual door to the storehouse is about half a mile BEHIND where we were currently standing with no shortcuts. Panic. Sadness. Frustration. It's on the OTHER other side. We got to the correct door about three minutes to the 5 o'clock hour, breathless and having just seen one of the largest horse poos ever and asked if it was closed. I must have looked so hopeful or defeated—can't tell you which yet, maybe a ridiculous bit of both—because the guard chuckled and let us in. Joke was on us because this place was positively buzzing with a thousand people. Shucks. But it was worth the trouble. After we made it though the gates, we were welcomed to, well, the gift shop. But that's expected. 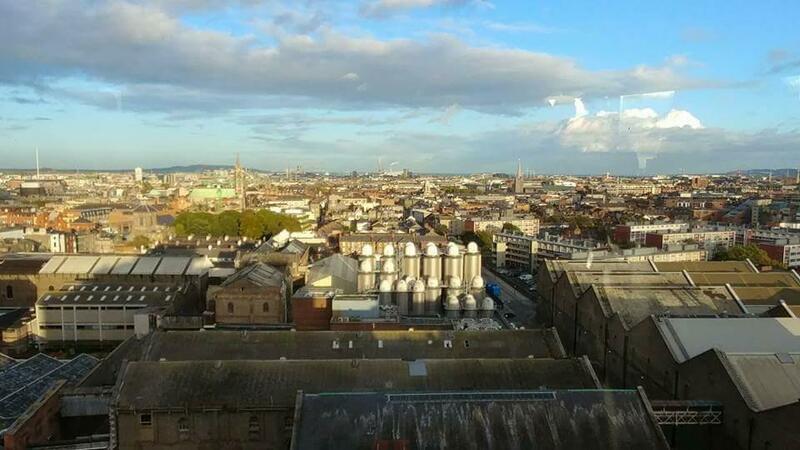 Further in it was an expanse of education of the beer process, as well as the start of Arthur Guinness and what he had to say on beer making in his family and moving to Dublin. You're introduced to barley (filling an entire pool!!) hops (growing in a wall *probably for show) and yeast (secret yeast display!) but best of the waterfall! Most saw it as a wishing well, as did I. Each floor had its own tales to tell, a look back at Guinness marketing and mascots, silly photo booth areas (of which I was too short to actually be in the photos—uncool) plus even a section on responsibility. The 9,000 year lease is a point of interest among pretty much the whole city, but you get to see it! As mentioned above, I'm no beer drinker. But, you know what they say: When in Dublin... So I learned that 45* angle to pour myself a(n almost) perfect pint of beer, sat with it at the table for a few minutes and got my award printed saying I am a beer pouring champion! So, there we sat, my full to the brim beer and I, staring at one another wondering who would make the first move. It's just so dark and thickly foamed on top and beery! My memory can still smell it. But my husband did not think our contest was exciting so we went up another few flights of stairs (with my full as can be glass still) to get to the Gravity Bar where there is a 360* view of the city. It was JAMMED with as many people as a Detroit bar is during Tigers opening day—and just as difficult to get through. My husband and I were split up in the crowd and I spilled my beer down my front like a child. Super. Thanks, guy in gray sweatshirt. We had to wait in line to look though the glass walls for a bit but it was completely worth it. It was completely worth everything it took to get there, from the crying feet to the horse doo, to walking up 7 flights of stairs and smelling like skid row. It was incredible and amazing and the only thing I would ask to change was that the windows had some sort of magic self cleaning option or a never-grime solution so that the photographs taken didn't have hand prints hidden in them like the Blair Witch house. My beer still (mostly) full and in hand—seriously delaying the drinking by treating it like some sort of pet. I think I held on to that beer for 10 more minutes before Chris asked if I was going to drink it. A hint of a dare? Again, when in Dublin... So I drank some. AAAAANNNNDDDDDD hated it. I surely did! Boy, did I! My memory is still recoiling (with a smile). So, as Chris was finishing his actually perfect pint, I gave him mine after sipping another two or three times to see if I could get the hang of it. I didn't. But, guess what, Chris! The Galaxy Bar and Storehouse are closing in ten minutes, so drink up! He did. But he liked beer and a challenge! I asked him if I should take my glass home because I'm a looter at heart, a fact that my husband knew about me in general due to my never trying to hide it but he got to see firsthand how devilish I can be. He asked me not to, though, even though I knew nobody would miss it because we saw not one or two, but probably five glasses break in the Galaxy in ten minutes. Alas, I'm a looter but still a good person (but tell that to the handful of barley from the pool that now sits nicely in an ornament I made for our Christmas tree—so, not a total miss*). 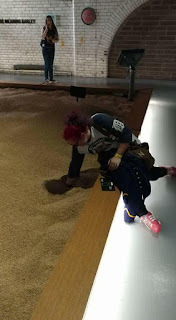 All in all, for the adventure alone the Guinness Storehouse was an absolute victory. We met another group from Metro Detroit for the second time that day (Sup, Lauren from Brownstown?!) in the Galaxy Bar and giggled over the penile shaped St. Patrick's Tower. 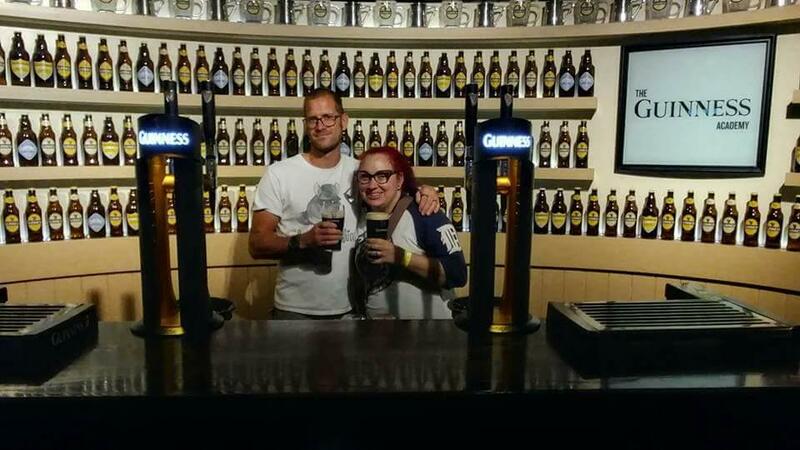 It was more than just a brewery tour—it was educational about the process, the history of Guinness brewing, the Guinness family (brewing is in their history prior to this factory AND THEY HAD 21 CHILDREN), a whirlwind of advertising and even the gift shop was moderately priced and fun. If you're out on the town or looking to book a few things while in Dublin, I can't say enough how cool and vast the Storehouse is. If we had time we probably would have gone another go to see what we missed. We will definitely return. *I don't recommend looting barley from pools. But I'm a professional. Just ask Detroit. Wow! This sounds so fun! Guinness is the only beer I drink! I recommend going! I went using the Dublin City Pass, which was great (let me know if you haven't heard of that) and it was the best tour I took- and I don't drink beer at ALL so that's really saying something!